Only 5 days to the long a waited Kampala city festival, all Ugandans, East Africans and travelers from all over world are yet to enjoy the once in a lifetime Kampala carnival. On 8th October 2017, Kampala and Uganda as a whole will hit the 6th celebration of Kampala city festival since 2012 when it was first celebrated to promote domestic tourism in Uganda. 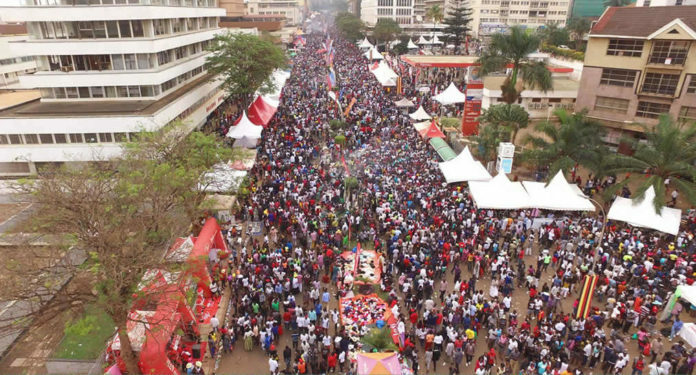 The carnival is the biggest street party within the city center celebrated every first week of October where all businesses, public and private transportation are put on hold for all people to walk on all streets of Kampala from 6:00am to midnight. As you walk or drive along all streets of Kampala, local markets, shopping malls, public and private offices or else using any public transport means all over kampala, the only word repeatedly said is the forth coming “Kampala city carnival”. Taking part in the festival is the only way to enjoy the great Kampala city life and all it offers. The ceremony is accompanied by colorful sights, vibrant sounds, dynamic beats along with an array of floats winding through the streets with dancers, spinning, whirling and twirling to the sweet mesmeric beats of celebration along the all designated festival routes. The festival is all about live celebration of Kampala’s culture, social life, harmony and revolution among which together make Kampala a best place to visit. Similarly, the carnivore is a platform for networking rewarding travelers with an opportunity to share their experiences as well as learning from each other. More still, expect a variety of drinks, foods whether fresh, roasted or cooked all at your disposal. Remarkably, this year’s festival is a companied with a pre festival concert and an international zone under the theme “Revel Diversity” These are to depict the facets and profusion of how unique and brilliant is Uganda’s culture. Different artist are to grace this ceremony for entertainment and these include Tanzania’s popular Diamond Platinum among other local and international singers. These will keep you fresh and happy along with your family and friends whom you will have come with. All participants in the Kampala city carnivore must have a ticket. The cost varies depending on the class and these are 20,000sh for ordinary, 40,000shs for VIP and 3000,000 for corporate tables. Tickets are picked from, shell lugogo, shell Bugolobi, Shell kiira road, shell capital, shell Kabalagala, shell Mengo, shell kawempe. Shell Namirembe; shell Bunga, shell Ntinda and shell Jinja road every day and you must pay cash. On the other hand, you can buy tickets via MTN mobile money or Airtel money by dialing *210#, Enter merchant codes 01231, enter the reason for dialing, and then the amount of money depending on which ticket you want to buy, whether ordinary, Vip or corporate tables and then confirm with your pin number. After completing all the steps, you will receive a confirmation package from Kampala Capital city authority, which you will present to get a ticket. In addition, there are sponsorship packages by platinum at a cost of 100,000ush and these include recognition from KCCA, non exclusive, unlimited co-branding on all available media throughout the publicity campaigns, 5 minutes of speaking at the concerts stage, prime space for a 200-seater at the main concert venue, 300 all access passes, VIP access route for your VIP guests and a 2 festival floats with your brand. Come, be part of the festival and enjoy Kampala city and all its treasures.